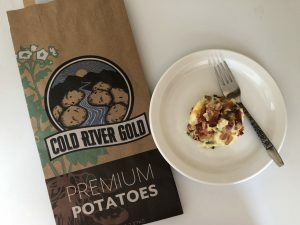 Mix mashed potatoes, green onion, and ¼ cup of the chopped, cooked bacon. Press cheese cube into the center of a ball of potatoes and work the potatoes to fully enclose the cheese. Dip the potato ball into your egg, and then roll in the remaining bacon bits. Place on a cookie sheet and bake on 375 degrees for 15-20 minutes. Cooking is complete when the cheese starts to bubble out of the balls.